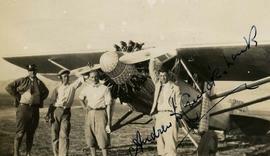 B&W print depicts four unknown men posing in front of a plane. "Andrew to [...illegible]" is written in ink on the image. Film depicts dog sledding, men gold panning and mining, shots of caribou, shots of the Yukon (likely Dawson City) and shots of a miniature train set. Film depicts the Dawson ice break up in May, a picnic, a softball game, various shots of ships and planes. The film also has shots of the sun at midnight over Dawson in June, and people mining. Film depicts a trip by boat, likely from Vancouver to Dawson. One of the boats taken was the Princess Louise. The film depicts various shots of the ocean, river, and other boats along the trip, and well as the scenery between Vancouver and Dawson. B&W print depicts five unknown men standing in front of a plane in the snow. B&W print depicts a sea plane grounded on what appears to be snow. There is a ship in the background. There are pen marks on the image. B&W print depicts two unknown men and an unknown woman posing in front of an airplane in the snow. There is a third man in the background.Note: colour adjusted on jpg.